Fidelio: Alice’s Odyssey is the feature film debut by actress turned writer/director Lucie Borleteau. The film chronicles the sexual and emotional tribulations of its principal protagonist, a young female sailor and her adventurous journey into sexual and emotional discovery aboard an old cargo ship. Alice (Ariane Labed, The Lobster, Assassin's Creed) is offered a placement on the ship after the sudden death of a crew member. She finds herself in familiar surroundings and male colleagues she has grown to know what to expect from. She does not flinch at the thought of sleeping in a dead man’s cabin while his body is still on board the ship. Although in love with her boyfriend Felix (Anders Danielson Lie), Alice goes on a journey of sexual discovery in her globetrotting voyage aboard the Fidelio. Labed as Alice manages to thrill as well as intrigue. Her character exists within the realms of a predominantly male milieu which provides an interesting study in womanhood and female representation. The film deliberately avoids the usual clichéd “woman in a man’s world” tropes. Instead, Alice is depicted as “just one of the guys”; she inhabits a world in which men are dwarfed by big noisy machinery surrounding them. At times their verbal interactions are limited to the odd grunt or small phrase in broken English or French; we also see the multinational crew communicate using body language, laughter and music in place of a common spoken language. Boreleteau does not hesitate in letting her characters express less than politically correct opinions about race, immigration, and everything in between. Alice is teased by the men and teases them in return, not afraid to be as crude and crass as they sometimes are. After initially rejecting the advances of Gael (Melvil Poupaud), a former lover, who enters her cabin one night whilst she's asleep and proceeds to undress her, Alice later embarks on a sexual affair with him. She continues to reaffirm, to herself and to all those who will listen, her undying love for Alexis back home. Another aspect of the film which is worth looking into is its title, a hint at grander and more classical cultural works such as Homer and his Odyssey, Alice in Wonderland and even Beethoven’s Fidelio - it’s not clear whether this is a deliberate attempt at more universal ideas of self-discovery and adventure. Boreleteau manages to capture the essence of post-feminist blue collar working women who by and large do not consider themselves to be the poster children for feminism. She achieves this through an unapologetic depiction of visceral interaction between Alice and the men in her life, and filmmaking that sets her apart from more conventional feminist ideas. 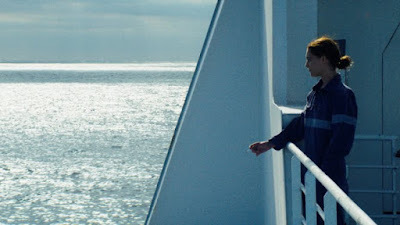 What the director does instead is build a brand new world around Alice, one in which nobody is surprised by her actions - her shipmates have learnt to accept her motivations and instinct. Alice is just another sailor at sea like her male counterparts, and she makes no excuses for her actions mostly driven by loneliness and desire.